Many people look forward to the latter years of their life. Most expect to retire and live at a relaxed pace that allows them to savor moments they may have missed while living as a worker-bee. For this reason alone, many people take time to plan every aspect of their retirement — from savings, to housing, and even long-term care. The only problem is that some of this planning is made on assumptions. And many of these assumptions change over time. For instance, premiums for long-term care insurance have been increasing steadily. So much so, that many insureds are wondering if they should keep their policies in place or bail and look for other options. Dawn-Marie Joseph, founder of Estate Planning & Preservation in Williamston, Michigan, explains the problem many people face. "Back in 2000, the cost of long-term care policies doubled, if not tripled, for many policyholders," she says. "This forced many people to cancel their policies and lose the money that they had paid premiums with." Fast forward almost 20 years later, and many retirees are still in a bind without long-term care options. The worst part is that it seems like there aren't that many alternatives to paying rising premiums for long-term care. Aside from dropping the insurance altogether, or accepting reduced benefits at the same premium, many policyholders feel stuck. A deferred annuity is an insurance product that acts as a savings vehicle. It is simply a way to receive consistent payments from an investment over a period of time, rather than all at once. Annuities help many people cover expenses in retirement, such as long-term care costs. A deferred annuity differs from an immediate annuity in that you contribute to the account over time or put in one lump sum and wait for it to grow through investment gains. Gains are not taxed until your monthly payouts begin. Before we get into how the deferred annuity works, it's helpful to know about the different types of deferred annuities: fixed and variable. These are more like bank CDs. You deposit a certain amount of money, and the insurer will pay you a guaranteed amount of interest over a specific period of time. With a fixed annuity, taxes are deferred until the contract moves into the payout phase in which the accumulated funds are annuitized for monthly payments. At that point, earnings are taxed as ordinary income. With a fixed annuity, you are locked into a certain interest rate. The investment yields returns like a bond or other lower-interest investment. This option would be better for you if you don't mind a lower rate of return in exchange for the security of knowing your return is guaranteed. Variable annuities are more like mutual funds. You typically get to choose from a variety of investments like stocks, ETFs, or money markets. There's more potential to earn higher yields as the stock market does well, but you'll also be exposed to market volatility. The insurance component makes it so that annuity investors will get at least a return of their principal, in case their chosen investments don't perform well. Contributions grow tax-deferred and, like fixed annuities, are taxed at withdrawal. If you have an appetite for risk, there's more of an upside potential with a variable annuity. Your monthly payouts could be higher if the investments in your annuity do well. However, if you are more interested in getting a guaranteed minimum monthly payment, as opposed to higher returns on your investment, a fixed annuity would be a better fit. With both products, withdrawals taken before age 59½ will be subjected to a 10 percent tax penalty. What are the advantages of a deferred annuity? In general, many people use this savings strategy when all other retirement accounts have been maxed out. A big advantage to saving money in a deferred annuity is the ability to defer taxes. As money grows in this account, the compound interest effect is not slowed down by tax payments that cut into the principal deposit. Another advantage of an annuity is that income is guaranteed. At minimum, there is a promise to return your principal investment. And if you die before using your annuity, most include a death benefit component that allows your beneficiaries to receive at least your principal investment plus any gains (this would be taxed as ordinary income). A deferred annuity is not for everyone, but it can be an option for some people. For example, if you plan to self-insure for potential long-term care needs, this product could help. 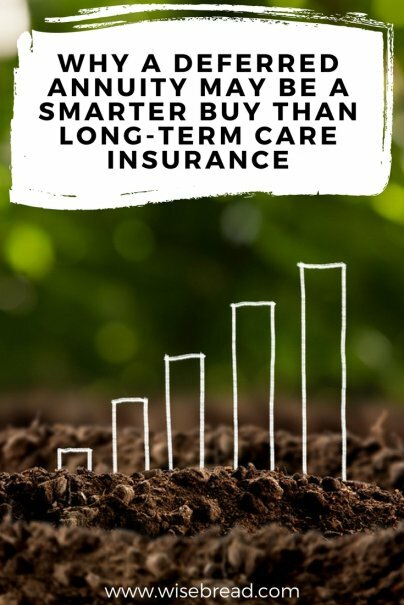 As mentioned earlier, many people are finding the cost of rising long-term care insurance premiums unbearable, so it might make more sense to divert that premium money into a product with better prospects of delivering benefits without breaking the bank. Another reason for choosing a deferred annuity may be out of necessity. Emily Stroud, a financial adviser, recommends "purchasing a deferred annuity instead of long-term care insurance, if the applicant is not likely to be approved for insurance after going through medical underwriting." Unlike long-term health care insurance, deferred annuities may be used for long-term health care needs or for anything else money can buy. For example, if the owner of the annuity doesn't ultimately need long-term care, they could either drawn down their money or leave the annuity proceeds to a beneficiary. Additionally, there are hybrid policies that let you choose various riders that allow you to customize the benefits that make sense for your particular situation. What are the downsides of a tax deferred annuity? The biggest downside is that this product typically requires a large sum of money to make the initial deposit. Furthermore, it has to be an amount of money that you won't actually need for the length of time the deferred annuity requires. Sometimes, this can be five, 10, or even 20 years. Withdrawing funds early often comes with steep penalties. Another issue is that the guaranteed interest rate may not keep pace with higher market returns. Though you'll get regular payments from an annuity to cover living costs, you could miss out on better returns if you had invested in stocks instead. Annuities, in general, have a bad reputation for being costly due to commissions and fees passed on to the annuitant. But not only is it possible to find low-cost annuity products, but one could also argue that the high premiums for long-term care insurance are just as costly or even more so. Who would benefit most from a deferred annuity? You've got a lump sum of money you can invest or deposit for five, 10, or 20 years. You are not eligible for long-term care insurance or life insurance in general. Long-term care insurance is too expensive for the benefits it would offer to you. You don't need payments from your annuity right away. You don't mind the additional fees that you could incur with an annuity policy. You'd like a predictable stream of income. If you answered yes to one or more of these questions, it might be a good idea to sit down with your financial adviser to find out if a deferred annuity would be better for you than long-term care insurance.